IR35, also known as the intermediaries legislation, is an area of legislation that’s getting a lot of attention at the moment. Whether that’s down to decisions in appeal courts as to whether the IR35 legislation should apply to contractors, such as the cases of Christa Ackroyd and Mark Daniels, or because of changes to how the legislation is enforced in the public sector, there’s plenty of news to follow. 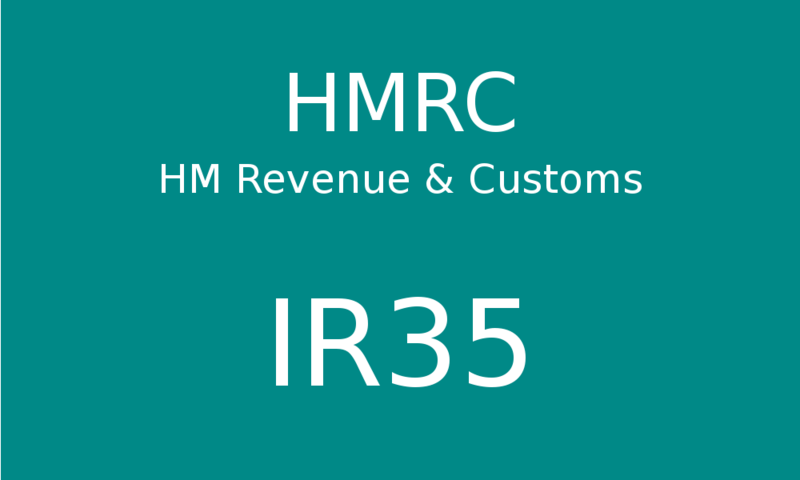 The latest development in the realm of IR35 is a recent HMRC consultation on how to improve IR35 compliance within the private sector. This consultation comes in the wake of changes made to the public sector in 2017. Although the aims of the consultation document are well-meaning, the practicalities of introducing IR35 compliance measures to the private sector could be troublesome, as outlined below. On 18 May 2018, HMRC released a consultation seeking views on how compliance with the IR35 rules can be increased in the private sector, following an announcement by the government during the Autumn Budget 2017. The consultation will remain open until 10 August 2018. HMRC believes that, at present, only 10% of independent workers, contractors, and freelancers who should be within the scope of the IR35 rules are compliant with the rules. What’s more, HMRC estimates that the cost of such non-compliance within the private sector will grow to £1.2 billion a year in lost revenue within the next five years. Given that HMRC believes that the loss of tax revenue from non-compliance with IR35 during the 2017/18 tax year totalled £700 million, HMRC clearly feels the need to act now to encourage compliance. One additional driving force behind the private sector consultation is HMRC’s perceived success of the reforms to IR35 in the public sector during 2017. HMRC has indicated that the reforms in the public sector have led to increased compliance, and so the hope is that reforms to the private sector will be similarly beneficial. However, the public sector reforms have not been without their share of criticism, and there are conflicting opinions as to whether the public sector reforms have truly been successful. As such, many may argue that reforms to the private sector are too premature, or even undesired, given the issues the public sector rollout has faced. On 6 April 2017, changes were made to how the IR35 rules are implemented for public sector contractors. The reforms meant that it became the responsibility of the payer, for example a public authority or agency, to determine whether a contractor was subject to the IR35 legislation. For instance, if there was evidence of an employment relationship, then the payer would deduct income tax and national insurance contributions at source. Previously, the responsibility of determining whether a contractor is within the scope of IR35 was with the contractors themselves. As such, the reforms marked a significant shift in how IR35 status is determined, and how the relevant tax is collected. However, how successful the IR35 public sector reforms have been since their implementation over a year ago very much depends on who you ask. From HMRC’s perspective, they believe that evidence indicates that the public sector reforms have been successful, arguing that an extra £410 million of revenue has been brought in as a result of the changes. Based on data taken from April 2017 to February 2018, HMRC also stated that around 58,000 extra public sector contractors are now paying income tax and national insurance, which has helped contribute to the extra revenue raised. Despite HMRC’s positive outlook on the reforms, not everyone has shared the same opinion. There have been a number of reports that the reforms have not gone as well as planned. This includes complaints that implementing the reforms has been administratively difficult and that some contractors have left the public sector following the reforms. Although HMRC argues that the impacts of the reforms have not been as negative as some may suggest, it’s clear that there are some concerns over whether the private sector reforms should follow in the steps of the public sector reforms. What could the private sector reforms look like? There are no concrete plans at the moment when it comes to how the private sector reforms will look. The consultation itself comprises two main areas. The first is an examination into how effective the public sector reforms were, while the second area focuses on what challenges there are currently with non-compliance in the private sector, and what steps could be taken to improve compliance with the IR35 rules. It’s worth noting that the private sector reforms won’t necessarily be a replica of the reforms that were introduced to the public sector, and that other approaches will be considered. However, part of the consultation will also look at the potential of extending the public sector reforms into the private sector. In particular, HMRC welcomes any views that suggest how private sector reforms could be implemented in a more efficient and less burdensome way, if reforms similar to those in the public sector were introduced. So it seems on first impressions that HMRC is leaning towards implementing reforms similar to those in the public sector into the private sector, which will be cause for concern for some. As HMRC won’t publish a summary of the responses to the consultation until later in the year, we won’t know for some time how any potential reforms will look. So for contractors working in the private sector, it will very much be a waiting game to see what changes may be heading their way. Although there are changes on the way in terms of how IR35 will apply to private sector contractors, the good news is that the consultation will not examine how IR35 status is currently determined. This means that the IR35 rules should still continue to apply to independent contractors who provide services through a personal services company, and who are determined to be a disguised employee of their client. Nevertheless, if you’re an independent worker, contractor or freelancer working within the private sector, this recent consultation document may be some cause for alarm or uncertainty as to your position going forward. If you think you fall within the scope of IR35, then the best thing you can do whilst waiting for the outcome of the consultation is to keep up to date with the latest developments within the IR35 landscape. It’s no secret that the IR35 rules can be difficult to interpret at the best of times, particularly if you have a contract that contains features that indicate both employment and self-employment. Given the additional complexities that may arise due to the proposed changes to how IR35 is enforced in the private sector, there’s never been a better time to check whether you fall under the scope of the IR35 legislation. If you need any further advice, don’t be afraid to reach out to your local accountant or tax lawyer to discuss your situation.